Is rather unkempt-looking, cough, coarse and hard. Can be plain white, brown, black, red, or grey. 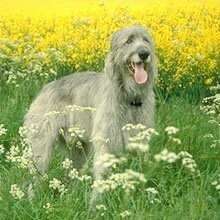 Irish Wolfhounds are friendly, gentle, loyal, and calm. Irish Wolfhounds are friendly, gentle, loyal, and calm. This dog gets along well with children, other dogs, and any household pets. There will be no problems provided early socialization has taken place. You can find Irish Wolfhound puppies priced from $300 USD to $2500 USD with one of our credible breeders. Browse through our breeder's listings and find your perfect puppy at the perfect price. This dog gets along well with children, other dogs, and any household pets. There will be no problems provided early socialization has taken place. Regular grooming with a brush and comb is required. Twice a year, dead hair will need to be plucked from the coat. This dog is relatively easy to train, so a gentle approach will suffice. The exercise needs of this dog are uncomplicated. It will adapt itself to the activity level of your family. However, it would prefer long walks in the country. Irish Wolfhound Puppies for Sale - Shipped Worldwide! Finding the right Irish Wolfhound puppy can be dog gone hard work. PuppyFind® provides a convenient and efficient means of selecting and purchasing the perfect Irish Wolfhound puppy (or Irish Wolfhound puppies) from the comfort of your home, 24 hours a day, 7 days a week. Take advantage of our PuppySearch or leisurely browse our directory of hundreds of dog breeds, Irish Wolfhound dog breeders, Irish Wolfhound dogs for adoption, and Irish Wolfhound puppy for sale listings with photos and detailed descriptions. Some Irish Wolfhound puppies for sale may be shipped Worldwide and include crate and veterinarian checkup. Many Irish Wolfhound dog breeders with puppies for sale also offer a health guarantee. With thousands of Irish Wolfhound puppies for sale and hundreds of Irish Wolfhound dog breeders, you're sure to find the perfect Irish Wolfhound puppy.